Rebecca S. Skillman - Skillman Family Association Inc.
Rebecca S. “Becky” Skillman is a Hoosier and native of Bedford, Lawrence County, Indiana where she was born on September 26, 1950. She is married to her high school sweetheart, Steve, and they have a son named Aaron. Becky began her political career in 1977 when she was elected to the office of Lawrence County Recorder. Eight years later, she was elected as County Clerk. In 1992, Becky was elected to the Indiana State Senate, where she represented Lawrence, Monroe, Jackson, Washington, and Orange Counties. She also served as President of the Association of Indiana Counties. During her 12 years in the Senate, she led the charge to include the state’s small towns and rural communities in its economic development agenda. There, she authored plans for development in distressed counties and revitalization of downtown areas. 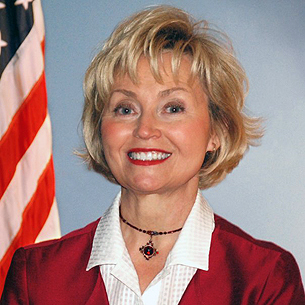 Rising quickly through the leadership, she became Majority Caucus Chair, the first woman in history to serve in the Senate Republican leadership, and the first elected female Lieutenant Governor in Indiana history when Mitch Daniels selected her to be his running mate during the 2004 election. Becky was sworn in on January 10, 2005 and served two terms as the 49th and 50th Lieutenant Governor of Indiana. Lt. 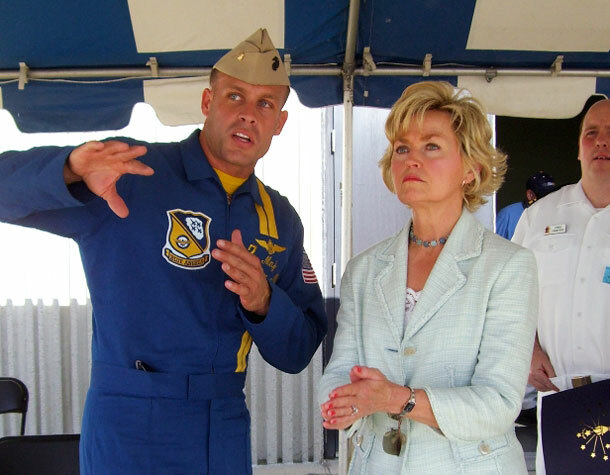 Governor Becky Skillman with Navy Blue Angel #7, Major Nathan Miller, during an appearance on August 23, 2007. Photograph by ET2 Evan R. Shearin, USNR. The National Lieutenant Governors Association said Becky Skillman had more legal duties than any other Lt. Governor in the country. She soundly managed five state agencies with operating budgets totaling $1 billion — the Indiana State Department of Agriculture, the Office of Energy Development, the Indiana Housing and Community Development Authority, the Office of Community and Rural Affairs, and the Office of Tourism Development. Additionally, she chaired the state’s Counter Terrorism and Security Council, and served as President of the Indiana Senate. In 2012, Becky considered a run for Indiana Governor but then announced she would not pursue the office due to a minor medical condition.